What’s the oldest thing in your refrigerator? Chances are that it’s the almost-but-not-quite-empty jar of mustard. Conditioned by decades of backyard barbecues, brightly colored squeeze bottles, and grab-’em-by-the-handful packets, Americans are at last tuning in to the taste of homemade condiments. The time has come for homemade mustard—and you won’t believe how easy and tasty it is. 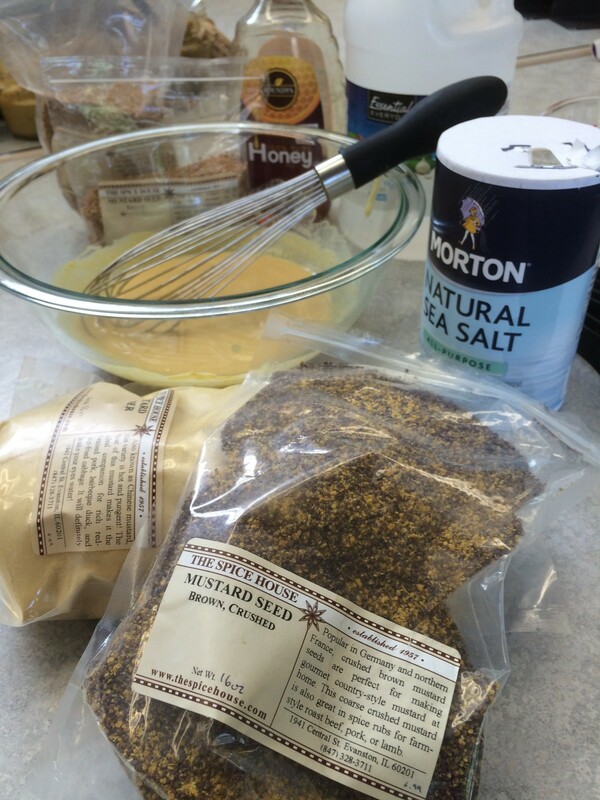 Mustard powder makes a much stronger spread than mustard seeds. Best bet? A combination of both. Hot water mellows mustard’s heat—use hot instead of cool in any recipe if you prefer less bite. Soak whole grain seed in vinegar and water for 48 hours to soften it before using it in a recipe. Keep the seeds submerged, not floating. 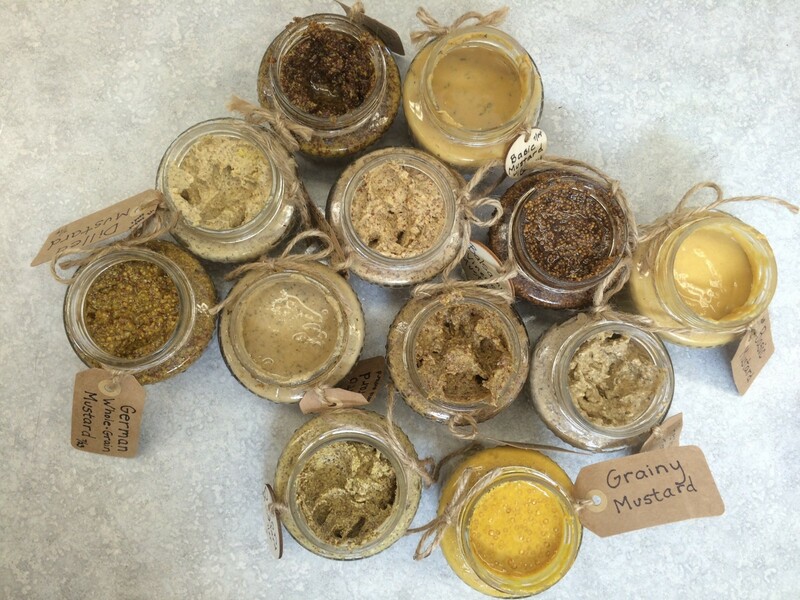 Freshly made mustards should mellow for 2-4 weeks at room temperature on a pantry shelf. Refrigerate after the desired pungency is reached. Homemade mustards last 6 to 12 months in the refrigerator. 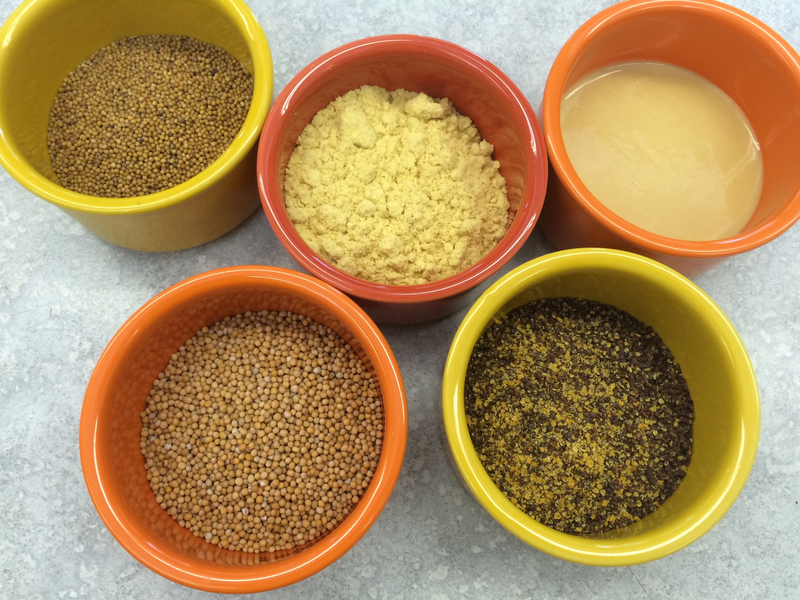 Clockwise from top left: hot mustard seed, yellow mustard powder, a finished basic yellow mustard, brown crushed mustard seed, and medium-hot mustard seed. After making that first quick batch of basic mustard, Nancy passed around ten jars of flavored mustards for us to sample. Revelations all! Mustards make a sandwich (and a hot dog, as any self-respecting Chicagoan knows), and homemade mustards will forever change your approach to sandwiches. Try mixing hot mustards with mayo for a deliciously different spread. You’ll also rethink deviled eggs…potato salad…pork tenderloin…veggie sauces…and salad vinaigrettes. Homemade mustard in a single jar or assortment makes a great gift that’s sure to be enjoyed! Homemade mustards make awesome gifts. Need a football season party gift? Check. Hostess gift? Check. At the holidays, gift neighbors, co-workers, and foodies with a package of three different mustards in quarter-pint jars—delicious and memorable! Experiment, and build your gift stock—remember that it takes a couple of weeks for mustard to mellow—and the next time you’re cleaning out the refrigerator, recycle that old jar of yellow stuff and replace it with a jar of your own fresh, tasty, homemade mustard. Brassica nigra in seed and in flower. The seeds are contained in conical pods called silique. Yes, mustard seed comes from a plant—three different plants, in fact. All are in the Brassica family. And yes, you can grow your own mustard plants for seed—just be sure to harvest it all, as mustard can quickly self-sow and take over a garden bed. Looking for more tasty, homemade gift ideas? Make some Vanilla Spice Apple Butter with scientist Pati Vitt, or see what other gifts gardeners give!